YOU GET FULL CUSTOMER SUPPORT TO ADVICE YOU ON ANYTHING YOU MIGHT NEED! Please check your specifications before making the purchase. Mounting bolts & Key way are not included. GASOLINE PRESSURE WASHER VERTICAL PUMP- High quality replacement pump for your pump. 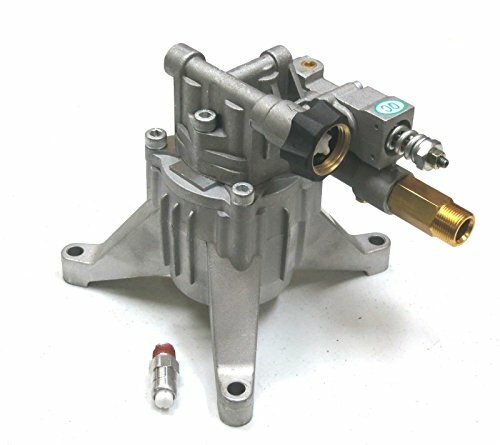 These are OEM replacement pumps for many models of pressure washers. If your old one stopped working, is corroded etc. don't hesitate! 2800 PSI 2.5 GPM RATING- This pumps is rated at 2800 PSI and 2.5 GPM which is great for any and all small house cleaning projects. Very safe pressure even for washing your car or other things without being afraid to damage the paint! UNIVERSAL FITMENT- This pump comes with a standard 7/8" shaft which is universal for all small pressure washers. Hose connecters are standard M22 so you don't have to worry about buying extra fittings. Your 5.5-6.5 HP engine will power this pump with no problem and bolt on directly! If you have any questions about this product by Himore, contact us by completing and submitting the form below. If you are looking for a specif part number, please include it with your message.